The following set-ups have been developed by RSD6 users. If you have a good one you'd like to share, we'd love to put it up on this page! Springs are one of the most integral parts of your set-up. There are so many different theories of what is best and what is not. Typically we run softer springs on bumpier tracks and harder springs on smoother tracks. Keep in mind that harder springs tend to put more pressure on the tires, so they can cause tires to overheat. If you are running on Spec tires, and your tires are overheating try running softer springs with heavier oil to prevent overheating. Generally a softer spring in the front will give a bit more initial steering but less middle and exit steering. Conversely a stiffer spring will give a bit less entry steering, but more aggressive middle and exit steering. In the rear a softer spring will give a little less aggressive steering coming into the corner, but more middle and exit steering (more rotation). When using a stiffer rear spring, you will experience slightly more turn in, but less rotation in the middle and exit of the corner. Shock oil is used to adjust 2 main things: Chassis Reaction and Total Grip. 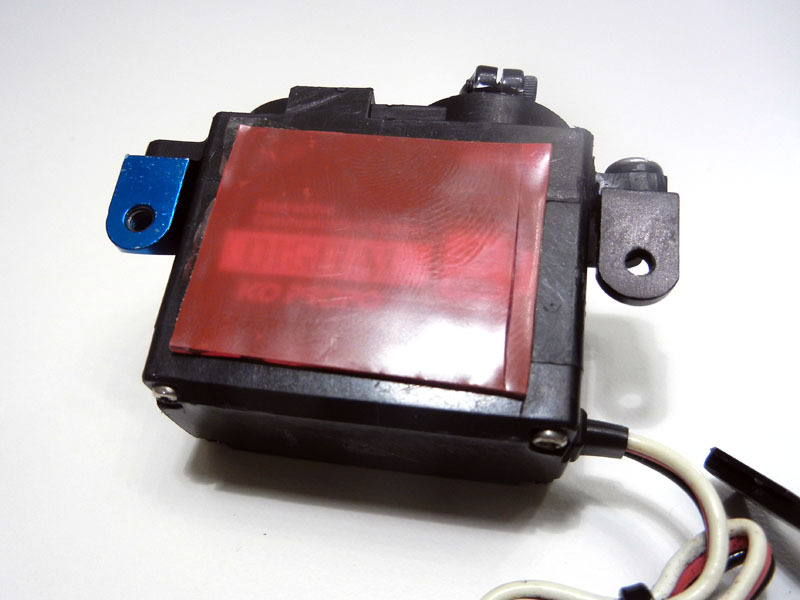 -Chassis Reaction: Oil affects the way the car reacts to initial transmitter inputs. The heavier the oil, the slower the reaction of the car, the lighter the oil, the quicker the reaction. Additionally, the more grip the track has or the hotter the ambient is, the thicker the oil you will use as the additional grip will make the car roll more violently and the hotter temperature will cause expansion of the shocks and thinning of the fluid. If you use thicker oil in the front, the reaction will be slower, which will take away initial grip going into the corner as it will slow down the reaction time of the chassis. The opposite is the case when going with lighter oil. When using Thicker oil in the rear, the car will roll less, decreasing rear grip when applying throttle to the car. Again, the opposite is the case when using lighter oil. -Total Grip: Oil can be used to adjust the total grip of the car. In high grip conditions you want to run thicker oil to take away grip. In low grip, you want to use lighter oil. Oil can also be a good tool when using softer than ideal control tires. Run heavy oil combined with a light spring to prevent tire over heating and maximize tire life. With the RSD6 you will typically start with about 500cst oil F/R. Adjust from there based on the premises given above. Our old friend and tuning legend John Stranahan once measured the roll centers on the TC5. What he found out was that the 1B blocks put the roll center closest to the floor when using the equivalent of a #3 camber link position on the shock tower. Theoretically, he argues this is the roll center that should create the most traction on a car. Going higher than this should remove traction from decreasing roll and going lower should decrease traction from too much roll. However, keep in mind that camber link angles and lengths can affect the roll center as well, so this might not always be the case. From our testing experience, it seems that with spec tires, the car makes more traction with the 0B Roll Centers than with the 3A. This would be in line with what John observed a while back as the roll center is closer to being on the ground. Remember, you are always looking for the most grip you can get at both ends of the car while achieving a balance of steering and rear grip. Under certain conditions this requires to run the rear roll center higher than the front to get the proper rotation. Almost never will you run the front higher than the rear. 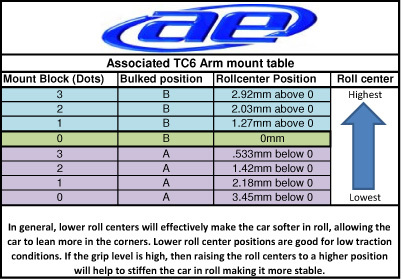 Below is a Roll Center Chart that an AE Team Driver came up with, this is great for reference when tuning your roll centers. This is one of he most important adjustments for your car. Adding shims behind the steering bell crank ball ends, will reduce your ackerman (the outside tire will turn more) which will make your steering radius smaller and the car turn more sharply. This is especially important on tight tracks with a lot of hairpins. On carpet, due to the increased grip the tires generate, it is recommended to run more ackerman (less shims). When it comes to adjusting rear toe in, we usually follow one philosophy. The less rear toe you can get away with, the better. When starting at a new track we usually start with 3 degrees and adjust accordingly. If we need more rear grip in the middle and exit of a turn, we increase it, if the car feels like it does not rotate quickly (like you have to wait for it) we decrease it. The less rear toe you can get away with, the better your top speed is going to be and the car will usually have more corner speed. Don't over do it though, too little toe and the car will be very hard to drive and can spin out easily. To find a good point, keep decreasing your toe by 0.5mm until the car starts sliding too much, once it gets to this point, add 0.5mm again and call it a day. Typically, high grip tracks use less rear toe and low grip tracks use more. Front Toe is used to adjust initial reaction of the car going into a corner. If the wheels are pointing outwards when looking at the car from the top, this is called toe out. If the wheels are pointed inwards, this is called toe in. Typically, you never run anything but Zero toe to about 1 degree toe out. The more toe out, the quicker the reaction of the car going into a corner. However more toe out can cause the car to become a little unstable in a straight line. We usually run 1 degree out under most conditions. Adjusting rear track width is a very important setting. The wider the rear is the less lateral weight transfer the car has, which makes rotation a little bit harder to occur. Typically you want to run your car wider on flowing layouts, where extra stability is beneficial. Wider rear track is also beneficial in High grip tracks, where you want to take away traction from the car. When making the rear end narrower, the car will experience more body roll, which in turn allows the car to rotate harder on its axis. Typically, you want to run a narrower rear end when grip is lower and/or when there are very tight corners. A narrower rear end makes the car more agile, but harder to drive. Much like adjusting the rear track width, front track width can be instrumental when fine tuning your car. A wider front end will make your car more stable into the corner, but then pivot harder around the corner while a narrower front end will make the car turn in sharper but lose a little middle and exit steering. The narrower front track should make the car feel more direct, while the wider front end will make the car feel a bit vague. Most of the time you should use wider settings for carpet and super high grip asphalt and narrower settings for asphalt settings and lower traction tracks. A lot of set-ups lately call for "arm sweep". Arm sweep is typically defined as the front hinge pins being wider than the rear hinge pins on the front arms. Arm sweep will typically decrease entry steering a bit and it will gain middle and exit steering. This is a good setting to use to make the car easier to drive, especially in high grip conditions. Many times this change is very, very subtle. 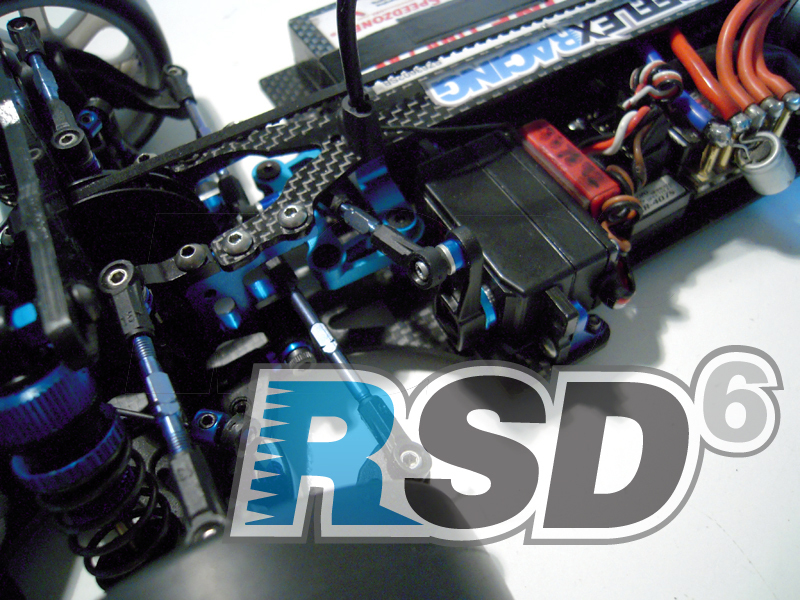 Below are some tips that we have found out along the way that can help you tune your RSD6 Chassis better. 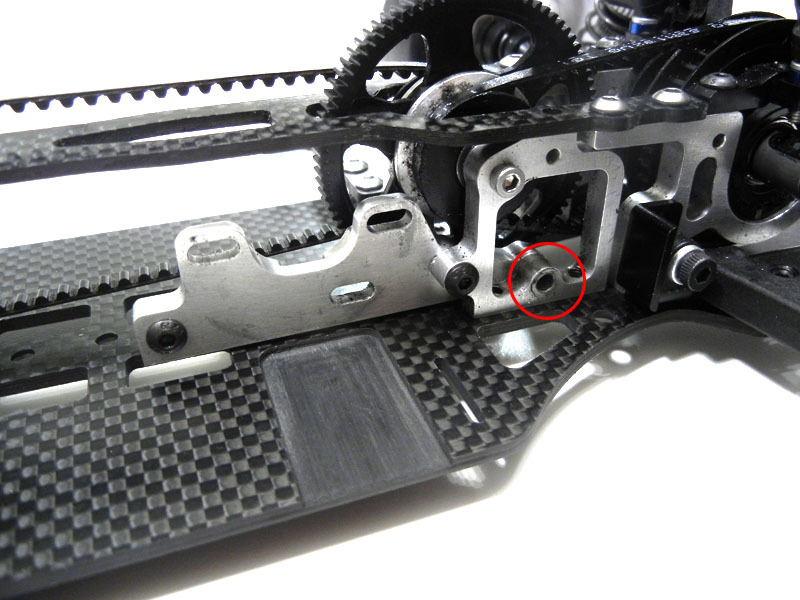 When assembling the car, leave out the most rearward screw on the motor mount. The car will have less of a tendency to tweak and it will generate more consistent grip. This works with the TC6 as well. 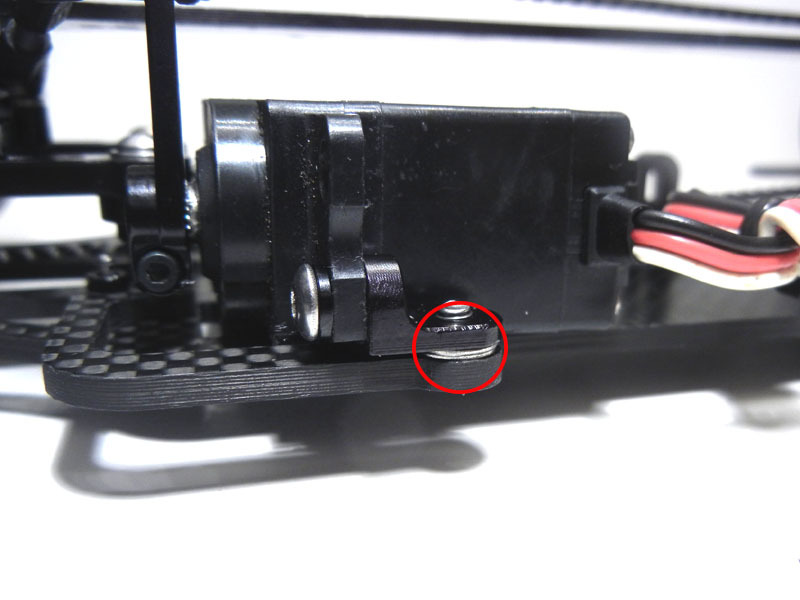 When installing your servo on your RSD6, you can use some double sided tape underneath the servo to provide some extra stability to the servo. Make sure you use some washers underneath the servo mounts to space them up as the chassis was designed to be used without servo tape. Note that you can also use a flexible adhesive like Shoe Goo to attach the servo to the chassis.